﻿ When the regular cycle of indie startups rotates the next batch in, more acts like Haim would be a blessing. That was the case back in 2013 during the release of their debut Days Are Gone, smashing the monotony of identikit, too-cool-to-care chancers by drawing clear inspiration from ’90s R&B, classic girl groups and a whole load of Fleetwood Mac. And with the soft, supple harmonies of the three Haim sisters and the sun-kissed vibes of the California valleys being massive selling points themselves – not to mention their high-profile insertion into Taylor Swift’s inner circle – that debut album could have easily spurred on the superstar status the band had become immersed in. And yet, looking at the bigger picture, Something To Tell You will likely prove the bigger determining factor, seeing if Haim can maintain the momentum of their debut in the long term, particularly with the four year gap between releases. And honestly, that’s something it can’t really do, mostly because its biggest peaks of quality come when Haim retread old ground. This is clearly trying to be a more diverse album than the debut, but all that really does is outline the limitations of Haim’s sound, namely that it doesn’t benefit from further strands of influence fed into it. At its best, Something To Tell You sees Haim’s pop nous return to the fore once again; at its worst, it can be a frustratingly lumpen, nondescript listen. But still, Something To Tell You isn’t a bad album overall, mainly because retreading old ground is still a perfectly valid route for Haim to take. Want You Back and Ready For You pick up pretty much where Days Are Gone left off, the former with its spry fizz and the latter with staccato guitar line and gummy synth pops, while the title track and You Never Knew go further down the soft-rock route and have the sort of low-key, washed-out quality to work quite well. Hell, even when they do branch out it’s not always that bad, like on the old-school soul of Little Of Your Love or Walking Away, which is fairly clumsy attempt at a sultry, early-2000s R&B track, but has character all the same. But on the flip side, there’s the blocky clatter of Keep Me Crying or the formless pile-up of sounds on Right Now, both of which outline just how limited Haim can actually be with regards to what works for them. That’s not even mentioning the random, inexplicable creaks and pitch-shifts that bubble up from the mix on almost every track for no adequately explained reason, that not only serve no purpose, but alongside the softer, ebbing quality of the instrumentation and Danielle Haim’s quivering vocals, there’s a level of dissonance between them and everything else that feels sloppy and not thought out in the slightest. Then again, there’s the faint desire to be charitable with Something To Tell You. It’s not as if the soft-rock and R&B that Haim draw from has much range anyway, and for as seldom as it works, at least they’re trying to cobble something together that’s a bit more interesting. It’s also the reason that simplicity and understated nature of this album can mostly be overlooked too; Haim clearly have a vision of how to get a good result from their music, and following the basic conventions while throwing in a few oddball quirks is the way they’re taking it. Honestly, it’s not the best way, but it’s a way that has enough clout when stripped down to its base ideals and running with them. It’s why the loose arc of scattered, often contradictory thoughts in the aftermath of a breakup can be largely forgiven, even with the lack of fleshing out or really a consistent through line. Similar applies to the instrumentation, the sort of blurred, vaguely hippyish geniality on the title track or the strings on Found It In Silence that doesn’t demand a great deal of focus, and doesn’t offer much complexity in return. Therefore, it’s difficult to really criticise Something To Tell You, as for the light, largely free-flowing album it wants to be, it effectively does that. That’s when viewed through that particular lens though, and in the wider context, its cracks are much more visible. Again, Haim have the knowledge and faculties to be a decent indie band, but this is them running at half-speed at best, a drop from their debut but one that should ultimately keep their fans happy. It’s pleasant and breezy enough with a handful of choice cuts for an appropriate summer listen, but given how it can feel flimsy at times and awkward at others, it mightn’t last for long after. 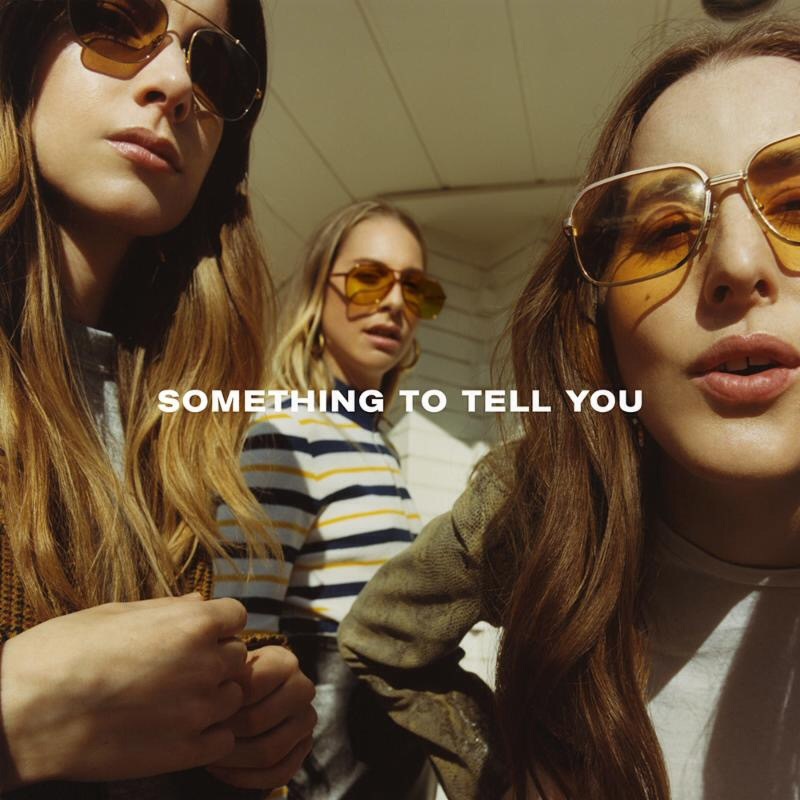 ‘Something To Tell You’ by Haim is out now on Polydor Records.